The most common cause of not being able to login is the case-sensitivity of passwords. The capitalization in your password must match what you use for the full student portal exactly. On mobile devices, the keyboard often makes this rather difficult to get right, and sometimes you migh get a space or tab in the password box before or after your password. 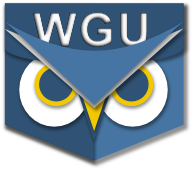 Usernames are not case-sensitive, and you should not enter the "@wgu.edu" part. Passwords are case-sensitive and should be entered without any spaces before or afterwards. Hope this helps, if not please send us an email so we can figure out how to get you going.